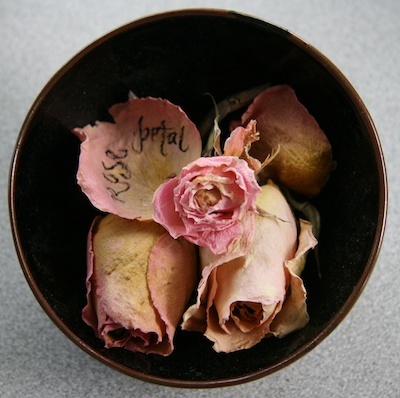 This little bowl of dried rosebuds have made their way through the house. At Christmas, the roses were accompanied by a bell. Eventually the bowl made its way to my desk with the addition of a miniature rose bud from Easter. After looking at one petal which had separated from the bud for several weeks, I wrote the word "rose petal" on it with my brush fountain pen. 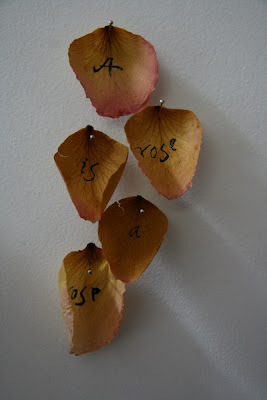 Today I wrote on a few more petals starting Gertrude Stein's famous line and pinned them to the wall. We'll see if this goes anywhere. I have always been attracted to art without permanence.